Amazing look, I love this sandals! You look marvelous. Love the lwd and the super cute heels! Such a gorgeous look Rachel! I love it and those heels are MADDEN GIRL?! Checking them out right now! Love these bright colors! Your heels are lovely and the jacket has the perfect pink color. Those shoes are the perfect fit for spring! This jacket is soooo pretty! I’m absolutely in love with the shade of pink.. and it looks so nice with the dress! Adore those shoes and the jacket is fabulous on you! THOSE SHOES!! I love them. This outfit is gorgeous! http://trendkeeper.me .. How to be productive & get featured! Love your jacket, great look. Those shoes are awesome! I love the color! I just put those heels in my shopping cart the other day…they are so fun for spring! Love how you styled them with the pink jacket! those shoes with that jacket is perfection! Those shoes are perfect!!! I’m crazy about them. This look is so lovely. Love the backdrop and that jacket! Too cute! Love those heels, you look fabulous! Love the colors in this outfit!! Love the yellow and pink combo here – I love wearing a neutral dress and playing the rest up with color! So pretty. gorgeous look! love the accent colors! I love the bright colors that you wear! You do such a great job of styling them. I like that the stand out against the simple, white dress. Those heels need to get into my closet asap! Just got those exact heels in blush, but I love the floral!! So fun and pretty for spring! Super cute look! I love the bright accessories for spring! You look so pretty in this bright and perfect for Spring outfit! Your shoes are to die for! That jacket and shoe combination is amazing!! Love the colorful heels! You are really clever with choosing these because even if your feet/ankles swell up, they can be made looser and then of course tighter after the baby is here. I really like these shoes but hate to support the Kardashians in any way but I have noticed that the Kendall & Kylie Madden Girl line is quite cute and affordable. Definitely a bright, colorful spring outfit. I thought for sure that those heels would be Mui Mui or Sophia Webster but Madden Girl!! So cute!! Love the zipper details on both the jacket and the dress! gorgeous shoes! love the whole look. Love the bright colors! Those heels are stunning! Pretty spring colors and the tress in the background are amazing! Gorgeous! Love the bright colors against the white dress. Lovely outfit! Nice jaket! I love the sandals… so pretty! I love the bright and cheery colours in your outfit! The heels are beautiful and tie the whole look together! This is such a lovely look. You look amazing! You+this dress= I die! So beautiful! I have had my eye on this dress for quite some time and when you posted it in the Neon I put it in my cart and now you are totally confusing me because I now want the white one!! Your pictures from your baby shower were also so beautiful. You did such a great job putting everything together. It looks so elegant and classic. Those shoes are so beautiful. You’re so beautifull! Your outfit is amazing! Would you be able to provide some insight about the sheath dresses you’re wearing? I noticed that the links for the dresses are often not maternity wear, thats great, and i was wondering if you are wearing them in your normal size if you already own it, or if you are purchasing regular sized dresses but in a slightly larger size to accommodate the bump? any tips you have would be helpful! The pink jacket is so cute! I love those shoes! I actually almost bought those a couple weeks ago! Also you look amazing (as always). Its so impressive that you’ve maintain your put-together outfits instead of resorting to sweats and Uggs, especially in the later stages of your pregnancy! I’ve been obsessed with those Madden Girl heels since they came out! So cute!!! The shoes are beautiful! I have to get my hands on them! Like this cute spring outfit!!! You look amazing as always!!! Gorgeous shoes and jacket! Pink is such a beautiful color on you! Looking great mama! I love your pink jacket and your heels are so fun! The baby bump isn’t stopping you from always looking so fabulous! Loving those heels! So stunning! Your jacket and heels are AMAZING! That outfit is so perfect! Loving this backdrop Rachel. And those shoes! Love that you kept the dress neutral and let all the colors shine through! Loving those shoes by the way!! 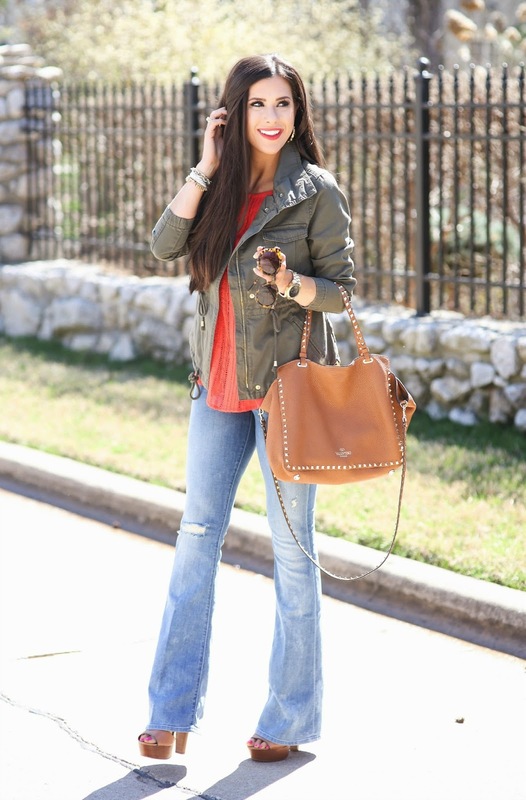 I have total jacket & shoe envy Rach – such a gorgeous pairing! Awwwww this is such a cutr look Rachel. you look really adorable and i fallin in love with these high heeled sandals. These Heels are to die for! Amazing!!! love the shoes! this outfit is so fresh! I love this look, the jacket is one of my favourites and sandals are just awesome too! Can you do a post on how you make non-maternity clothing work for your maternity days? I always tried when I was preg, but it ended up looking funky. Do you just buy a size up? Look for a specific fabric? Thank you!! You look RADIANT!